That's how old I am today. In the Lord, anyway. Twenty-two years ago this afternoon I walked up and out of the basement of Freeman dormitory and down to Our Lady of Perpetual Help in Quaker Hill, Connecticut, where I was baptized into the death and Resurrection of Jesus Christ. It was the most important moment of my life, and I had little idea of what I was getting into. And this was mercy on the Holy Spirit's part. It's been quite a journey since then. If you had told me then that on the twenty-second anniversary of that day I would get up in Rome, pray Morning Prayer and Mass and then descend to the secret life of an office where I would translate news blurbs from Italian to English and prepare letters for bishops in Ethiopia and Eritrea, I don't know what I would have thought. After twenty-two years, my greatest challenge is getting too comfortable. For better and for worse, I am fully socialized to religious life. I could live this life without devotion, without real prayer. I could do the assignment the Order has given me on natural talent alone. The few times I have to preach in my current circumstances I could manage on natural cleverness, though it would be a betrayal of the Church that has ordained me. The great danger is to get comfortable saying all my prayers and doing what I have to do, all without God. In this regard I am fortunate that God permits me certain afflictions, angels of Satan to beat me and keep me from getting comfortable. (cf. 2 Corinthians 12:7) Though I have put on Christ in baptism, the old Adam still haunts me, carrying on because he doesn't realize that he's dead, drowned at the bottom of the Jordan. But, though occasionally tempted, I don't despair. On the contrary, I have joy because God gives me the desire to pray each day, and I know that this is the Holy Spirit praying in me, if only I surrender to the grace. When I have to preach the same Holy Spirit gives me the words. And above all I know that God is faithful, and that if he has put into my heart the desire to be a 'convert' he will bring this grace to fulfillment, in this life or the next, and convert my heart to him. A couple of months into my third year in Italy I have landed in my fourth--and presumably final--location. First was a month in Assisi as a student at the Accademia Lingua Italiana Assisi then three months in the Roman neighborhood of Garbatella while a student at the funnily named Torre di Babele (Tower of Babel) language school here in Rome. 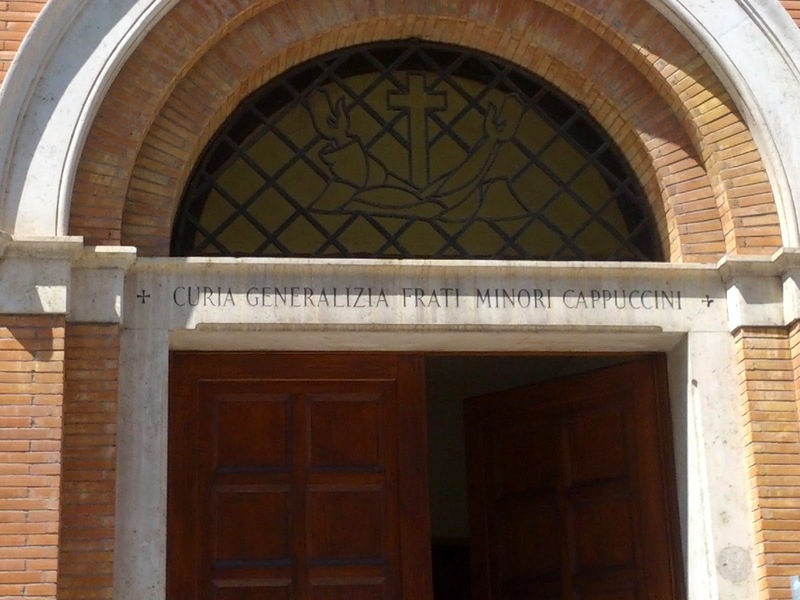 Then almost two years in the back section of the Collegio Internazionale San Lorenzo da Brindisi in the outskirts of Rome with the rest of the displaced fraternity of the General Curia, where it was staying while the Curia in town began renovations. And now, even though the renovations aren't quite done, I've moved with the rest of the fraternity of the General Curia back to its proper home in the middle of Rome. Mostly I'm grateful for the landing.